Kale is one of those trendy superfoods that I can actually get behind. It's full of vitamins A, C, and E and even calcium (take that, milk! ), is versatile in recipes and delicious too. Kale is hardy enough to grow in our garden over winter and when fresh, local produce is at an all time low it will be ready to eat. Wholefoods had kale on sale last week (two bunches for $4!) so I stocked up and have been putting it in everything. Over the weekend I made my favourite kale recipe, Wilted Kale and Roasted Potato Salad, and am itching to try 10 more recipes from this month's Real Simple. If you're wanting to introduce kale into your diet but aren't sure what to do with it, try out this salad and you'll be crazy for kale in no time too. Put potatoes single layer onto a roasting pan and toss with oil and salt and pepper to taste. Roast for 15 minutes, stirring once. Add 1 clove of minced garlic and roast 10-15 minutes more or until potatoes are done. Finally, top potatoes with cheese and roast 5 minutes until cheese begins to brown. 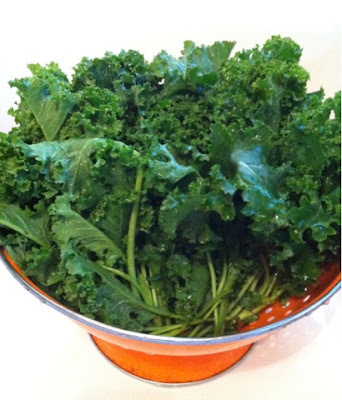 While potatoes are cooking, prepare the kale into a large bowl and set aside. Using a food processor, blend tahini, water, lemon and salt until smooth. Pour over kale. Add roasted potatoes, plus any remaining oil, to the kale and stir well. We serve this yummy winter salad with soup or a hunk of crusty bread and a glass of white.